Thank you for that post. I don't think it is too strong (and I've only been a widow six weeks). That's where I am coming from. I look at the world in some respects as very black and white (I'm in a legal related field, and my late husband was attorney), but I know people would simply NOT understand how I could be looking forward so soon. I just don't like the fact that I've been accepting so well this new life without him... Am I too resilient??? Like the others who posted - I am a widow of just over 3 months, and I think your post was well-written, too. And I share the feelings of these other two. Yes, I loved him; and yes, I grieve over the loss of him. But no - I do not feel guilty for moving on with my life. People have told me, "It hasn't REALLY hit you yet." And that is something else that they THINK they know, but do not. They don't see me at home, don't know how unexpectedly tears flow from hidden sources. But I am here, and I am alive and I want to be around others and hope to love someone again, someday. Much happiness to you and to your new bride. May you have MANY years together and many memories. Thank you for your post and for the comments. I am a widow of three months. My husband suffered a five year illness. I feel that his passing set us both free and it's refreshing to see like minded others who not only understand the finality of their spouse's death but recognize that they themselves are continuing to live. Your post is very true and appropriate for people who made the vow of "till death us do part" when married. My wedding vows were for eternity. 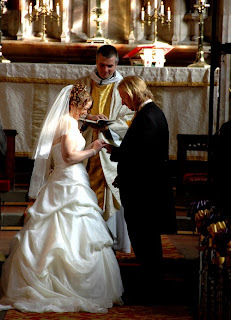 As our faith believes in re-incarnation, our level of handfasting (or marriage) included more than one lifetime. Although I had to search for my soul mate in this lifetime, after I found him, that was it for me. The joy that we brought to each other was an ecstasy practiced over several lifetimes. How could I possibly conceive of marrying someone else when I "know" that he is my eternal soul mate? Re the anonymous post of 16 June 2010. Not many people speak of love for ETERNITY--but that was our vow, too.I'm not keen on having another earthly reincarnation, but would come back again and again to love him for lifetimes, if that's what he needed. Hardly anyone speaks of this type of love, so thank you for letting me know there are others who expereince it. And, I wasn't offended by your post, Vic. In fact, your way of looking at the the marraige contract clarifed my way of seeing it. Hope you will be fulfilled in your new contract. I think you were in fact divinely inspired. I have been gripped by the guilt and commitment issues. My husband died suddenly,8 months ago. I am a wife crippled by my dependendency issues working on an obligation I can no longer fulfill no matter how hard I try. but thank you for bringing to life I do have a choice in this matter. I can choose my life.And still love our life. bless you. Death do us part, who wrote that, a man, a mere mortal. I know that my spouse has left me, not of her own choosing, but she is gone until we meet again and we will be together again, to enjoy the Lord' kingdom together I do realize that some men must have a female body next to them in the sack, so they quickly find a replacement. I am pleased with having the other side of my bed empty, waiting to be united with my true love. Everyone is different. My husband and I had such a spectacular life together, a spell-binding camaraderie, trips all over the US, interesting, unusual experiences, loads of fun, short story and novel writing, a band that played all over the southern part of our state, educating ourselves on any topic that sparked our interest, etc., etc. For me, no one could have given me that same level of exciting life. So, I will not marry again. But I am not living alone. My daughter moved me in to her home which consists of her wonderful husband and two lively grandsons. Now, I can't imagine living anywhere else. The loss of my husband will always be painful, but I am learning to envelope it into my psyche and get on with my life. It's what he wanted for me. It's the same thing I would have wanted for him if I had died first, for him to get on with his life in whatever manner was best for him. I have to comment even though I'm not a widow. I'm a woman on the other side dating a widower. This post gives me such a fresh perspective on life after death in a matriage. I hope to someday marry my boyfriend who happens to be a widower. I will share this blog with those who I know can and will benefit. Thank you. ...once again, this post is NOT for you. Hi, thank you Vic and congrats. I am a 4 month widow and desperately miss my best friend. That said, I'm sorry to hear that people are closing themselves off to the possibility of new love someday. People can have more than one soulmate. If you are religious, why do you think you know better than your God in deciding what's best for you? Maybe your soul needs to grow in ways your mortal self knows nothing about. What might you need to accomplish this time around? How do you know you don't have a new love planned for you that is also someone you were with un a last life and you chose to return to earth together? Be happy, be open and let love in. We are meant to love and be loved. We are meant to learn and grow. Don't shut the door on being happy. What God or dead spouse would want that for you? Best to all! Be happy! I was so glad to run across your post today. You see I am marrying again after being a young widow for almost 4 yrs. I watched my late husband linger for several months. My future husbands late wife was killed in a car wreck. While we both miss our late spouses we know that we need to live and love again. Being a hospice nurse I know that life is precious and plan to enjoy it again. I lost my husband in a home invasion on April 22, 2016 during what police believe to be a home invasion in our home. My husband just happened to be there as he has gotten a later load to pick up that day. My husband was 47 and I was 40. My husband grew up together. I was 14 when I met him and we had 4 beautiful children and 2 grandons before he passed. I am coming on the 6 month point and his birth is just a few days before and I sm just starting to function. I am having a really hard time because all of my life was wrapped around one another. We lived for each other, did whatever we could to make each other happy. I know God gives us permisdion to marry agsin but I have already found the man who I want to have all my memories with. I know I dont ever want another man but I want to help other homicide victims and help children in the foster care system. They still havent made any arrest so until tben that will be my main fight is to get justice for my husband, my children, my grandchildren and me. Hi this is a long shot but I would love to chat with you about something! My husband passed away almost 5 years ago and I am looking to find a way to maybe include him in my ceremony for my me and my son. Any ideas?